If there is a new frontier in bow engineering for 2011, it has to be designs that address the related issues of cam lean and torque. They make bows just a little easier to tune and a little more forgiving than the models that preceded them. 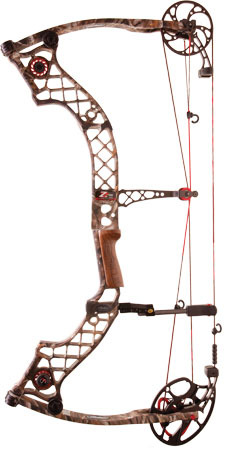 The Prime Centroid is one of two bows in the new Prime line, from G5. Prime takes head-on the related problems of cam lean and torque. That tack is the current rage in bow design; the unique thing here is Parallel Cam Technology, using two parallel string tracks that are outside the cable tracks. The result is that the string and cable are on the same plane in the centerline of the limbs, thereby virtually eliminating cam lean. Though cam lean accounts for most system-induced torque, some is caused by the cable guard system pulling cables to the side. G5’s Prime bows address this issue with the TI-Glide Titanium Flexing Cable Guard System, which pulls the cables toward the arrow as the bow is drawn, then allows them to slide back and out of the way to provide clearance for the fletching. The resulting reduction in torque not only makes for less horizontal nock travel and increased accuracy, but greatly reduces limb stress. John Maus has the eye of an artist and the mind of an engineer. It is hard to imagine a better marriage of aesthetics and technology, traditional craftsmanship, and modern methodology than a Lone Wolf bow. Listening to Maus talk about vertical stability and computer-controlled presses creates a strange disconnect when you are looking at one of his elegant bows, but then without missing a beat he goes into aesthetic qualities like selection of osage orange, the nine layers of lamination, the accent layers, and why he prefers grips with a thumb rest. Handsome without being too pretty, the Lone Wold Kayapo is also light, strong, durable, and, like a fine English Double shotgun, lively in the hand. It’s also accurate and forgiving, making it ideal for the experienced traditional bowhunter or the novice. At 60 inches and in draw weights as low as 20 pounds, the Kayapo starts at around $600 depending on options selected.